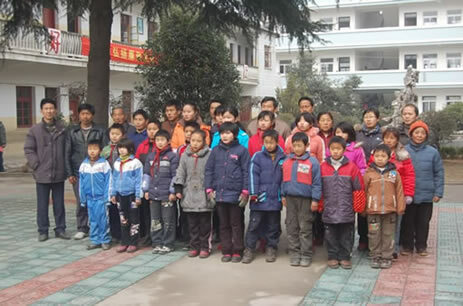 Starting in 2004 at Ningguo County(city), Anhui with 134 students, we now support a little over 1200 needy students a year (2016-17) in 4 counties, Ningguo County, Jingzhai County in Anhui, Yushe County in Shanxi Province, and Huining County in Gansu Province, thanks to your and others' generous support. We still use the care as in the beginning to earn and maintain your trust by working hard to ensure that your donation goes to the needy students 100 percent! A little support makes a big difference to the poor students who have so little and is also very inspiring to a lot of them. Please join our effort to help the poor kids get a very basic education---they really want it and work very hard for it. Just give them a little financial support they need NOW. Thanks a lot for your support in advance. You can make your contribution using Paypal or Credit Card by simply clicking `Donate' at left column. With the support of the generous donors overseas and in China, these students can resume their school. They are all very grateful for the donors, some of them even wrote long letters to their sponsors to tell them their academic achievements and to express their gratefulness. Sponsors also responed to the kids and encouraging them to achieve success. Please see detailed page of Letters. During Summer or Winter Break, Prof. Yang and other volunteers will go to China, and visit some of the poorest students and their families, delivering donations along with hope directly into the needy students hands. Professor Yang will bring back photos of these promising but unfortunate kids. All the students we supported are very poor and needy financially. The following stand out even among those very very poor. We seek sponsors for them so that their support will not get cut even in case we don't get enough donations in a given year. Please note an elementary school student needs about $80 for a year, a middle school student needs about $100 for a year, and a high school student needs $200 for a year.